The typical American company is getting older – a lot older. 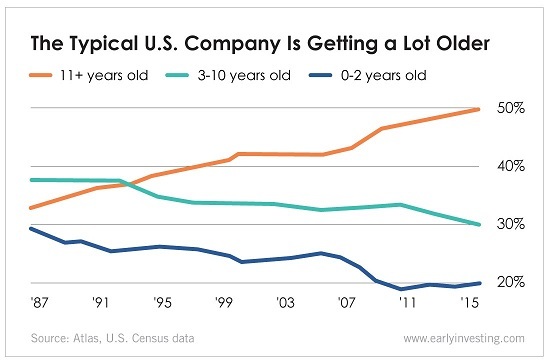 As our chart shows, according to data from the U.S. Census, almost half of U.S. businesses are more than 10 years old as of 2016. Just 20 years ago, fewer than 40% were older than 10. That’s because the number of startups is down. And even fewer are going public. René Stulz, director of the Dice Center for Research in Financial Economics at Ohio State University, wrote a report on this shrinking universe. An important point to consider, he wrote, is how companies have changed their investment strategies. More companies are investing in intangible assets – brand recognition, patents, copyrights, etc. If the firms give too much detail, which they could be forced to do by disclosure laws if public, their competitors can use the information. If they give too little detail, investors will pay little for their shares. It is not surprising, therefore, that for such firms, participation in public markets with their disclosure requirements is likely to be onerous. The good news is that while there are fewer public companies for investors to put money into, there are still high-quality pre-public startups out there looking for investors. You can find them on equity crowdfunding portals like Wefunder, SeedInvest, MicroVentures and dozens more. And the potential for startup investors is even bigger. Vin Narayanan, our Senior Managing Editor, learned recently that there are a lot of founders who don’t even know crowdfunding is an option for them. Luckily, Vin (and the Early Investing Team) is ready to spread the word. We have big plans. Stay tuned.